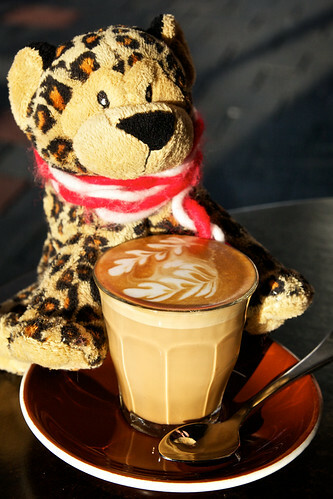 Jeombagee Sized Latte a photo by BaboMike on Flickr. Wow, probably the busiest day at work in a long time. Actually, probably the busiest day in this job. And I didn’t even get much done, just lots of learning and trying to make things work. No winning yet. Did manage to duck out and grab a coffee at the favourite cafe, Villino. Best coffee in Australia, without a doubt. Big call, but brilliant coffee. As you can see, I gave Jeombagee an outing, he’s been stuck indoors for too long. The beverage? A picolo latte, as recommended by the baristii (baristas?) Basically a machiatto but done as a latte. Fantabulous and the perfect solution to the 3.30pm yawnies I was experiencing. Hit up the casino tonight. No gambling, but trivia. Never seen a trivia comp with 40 questions, bonus rounds, guess the faces and a jackpot round all be complete in under 60 minutes. Speed trivial. Didn’t win but did have some fun. More of the same for tomorrow, lots of banking head against walls for the smallest step forwards, but I AM getting there (I hope). Other than that, its back to warm again after the weekends snow. Crazy weather. Bring back the snow.